This Square enclosure comes complete with pearl stone shower tray and waste. 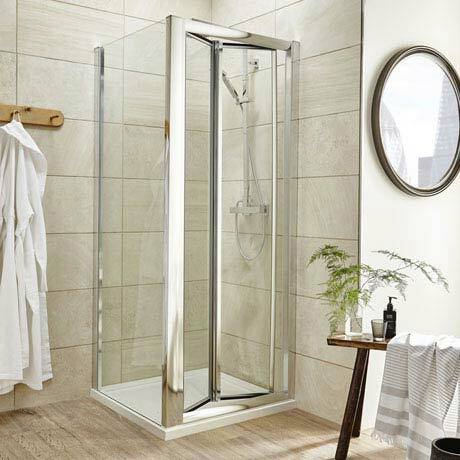 The enclosure features a Bi-Fold door that folds inwards which is a great space-saver, making this enclosure ideal for smaller bathrooms, En-Suites and Cloakroom's.The Enclosure is fitted with 4mm Toughened Safety Glass encased in a Polished chrome frame. Please Note - Any taps, showers or accessories pictured are for display purpose only and are not included (sold separately). Q. my space to the door frame is 75 cms, is the actual enclosure slightly smaller than the tray so i would only need to cut a small bit of the frame at the bottom? Hi, the frame has some adjustment in it. The bi fold door has 700-760 and the side panel is 720-750. Hope this helps, thanks for your message. The position of the bi fold door is optional, you can have it on any side. The tray is approximately 45mm high. This is actually supplied with a High Flow shower waste, which allows drainage of well over 32 litres per minute. This shower enclosure was just what i needed for my small bathroom, i think it was a really good price for everything that it came with such as the pearlstone tray and waste. The folding inwards door is such a good spacesaver.